As my five month lapse in blogging may tell you, sewing dropped low on my priority list in 2017. This has been an eventful year, in both extraordinary and harrowing ways. We've planned and unplanned international moves (on hold for a few years), grappled with the possibility of major career changes (avoided, thank heavens), and are now getting ready for a new family member this fall. That last one is, obviously, the biggest and best news. We'll be welcoming a wee baby girl in September! Sam and I couldn't be more excited about this incipient little one. We've decided on her name, picked out a nursery theme, and looked at reviews of more strollers than I knew existed. What I haven't done much of, however, is maternity sewing. 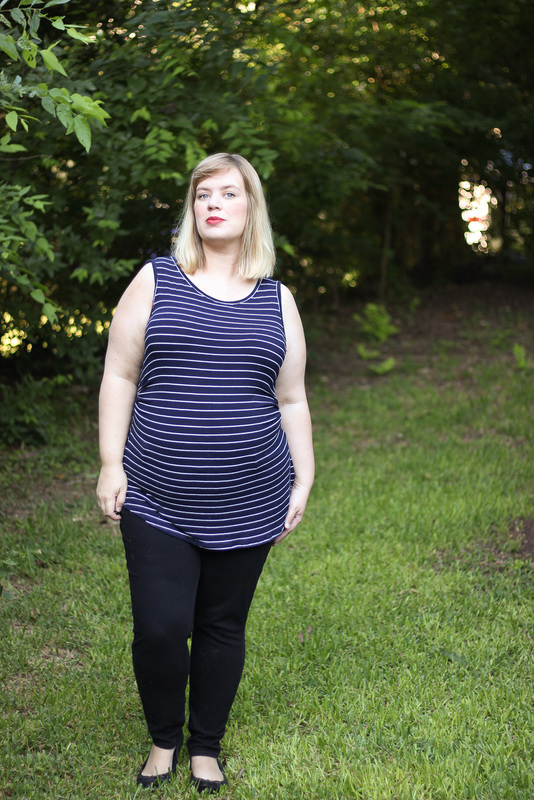 After confirming that everything was on track in early February, I canvassed the internet for maternity patterns, ordering scads of both contemporary and vintage designs. Then...promptly sewed none of them. Did you know that pregnancy has side effects? Shocking, right? 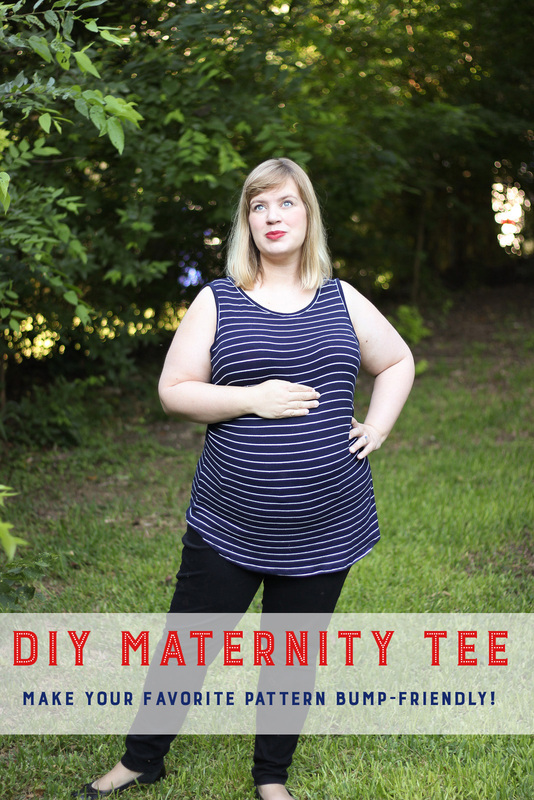 I was lucky enough to avoid the morning sickness, but not some skeletal issues that make sewing for long periods of time difficult. I'm managing them well, but only by being exceedingly careful about how long I spend sitting. Or doing pretty much any one thing for long periods of time. Not that it's all doom and alignment gloom around here. 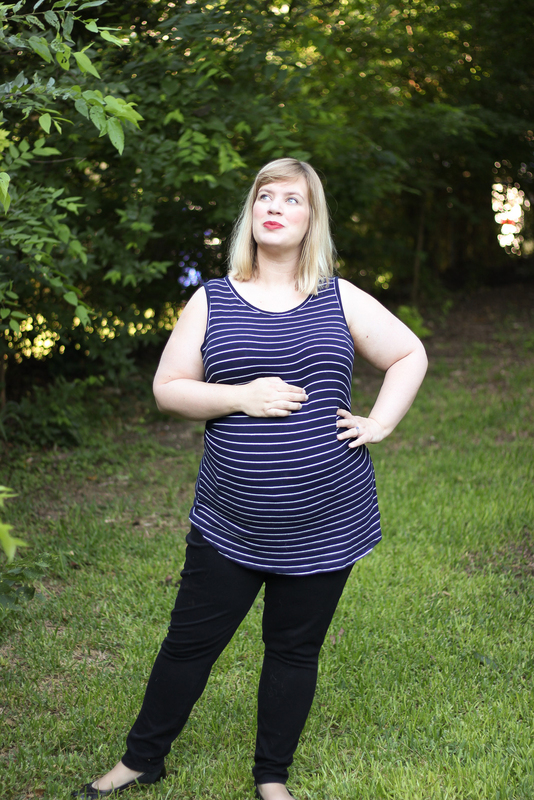 Pregnancy has been a joyful experience, aside from navigating side effects, even if it has put a cramp in sewing binges. 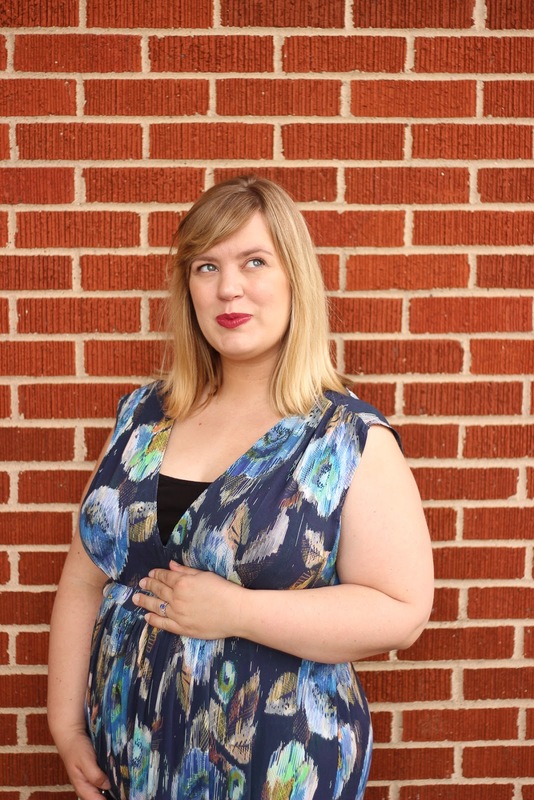 Thankfully, I haven't actually needed real maternity clothes until recently. Other than switching out to stretchier pants, most of my established wardrobe worked for the first twenty-or-so weeks. Colette Monetas, Myrtles, and Cashmerette Turner Dresses were in heavy rotation, but even my looser shirtdresses are only now becoming uncomfortable. It's getting to be that time, though. 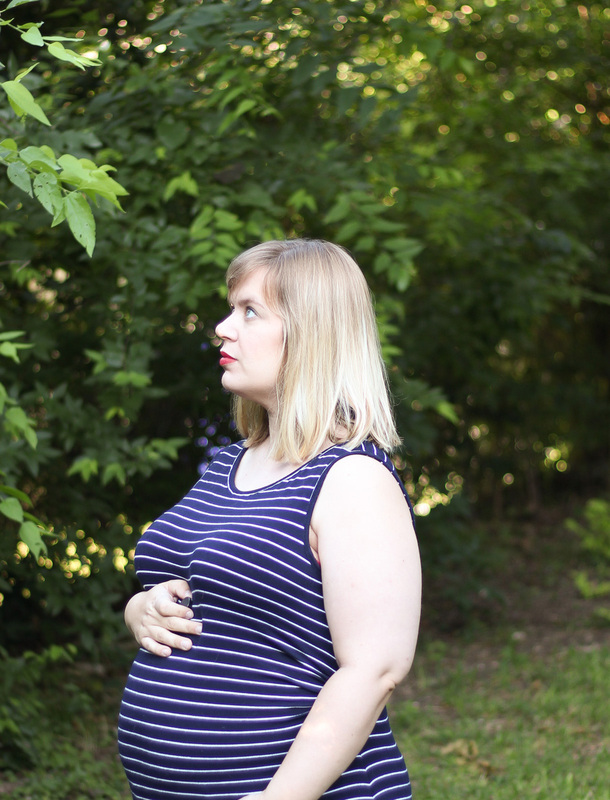 Strangers aren't asking about due dates yet, but the bump becomes more noticeable each day. 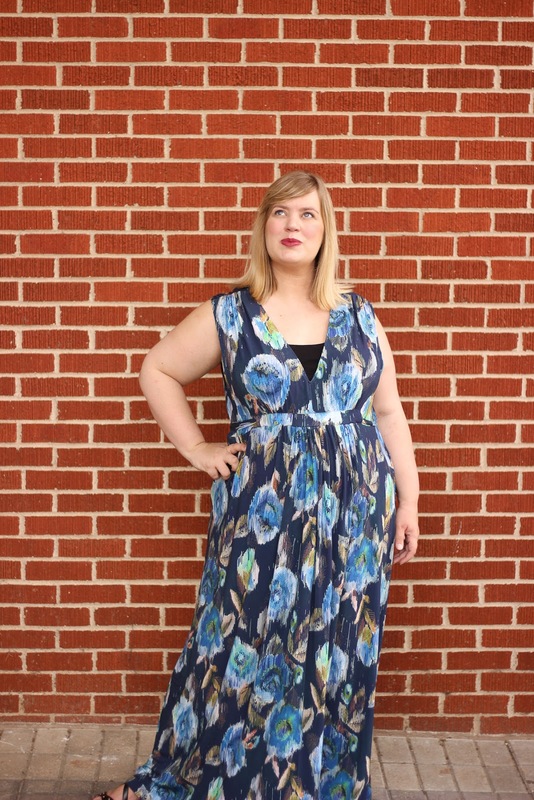 Billowy maxi dresses and heavily gathered skirts suddenly sound glorious. 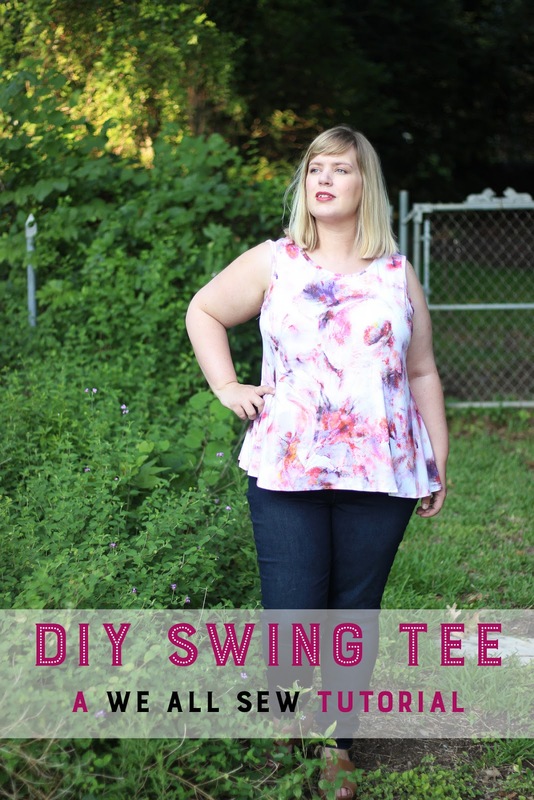 I want to swath myself in pretty fabric, without having to worry about constricting waistbands. Maternity sewing will have to be slow, but hopefully I can produce a few pretty pieces for these last four months. To begin that quest, I chose Butterick 6226, a pattern that actually has positive reviews as a maternity and non-maternity dress. I love the idea of making clothes with more longevity than this summer. 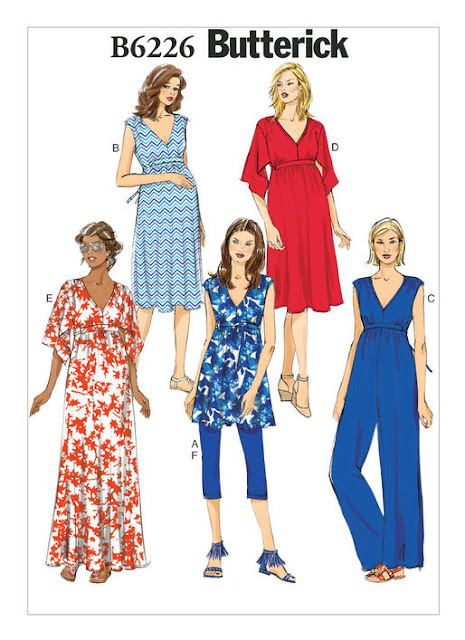 This pattern features a pullover, vaguely caftan-esque dress with cap or draped sleeves, three hem lengths (tunic, below-the-knee, and maxi), and even a jumpsuit variation. Naturally, I opted for the dramatic maxi of View E. Hooray for yards and yards of soft, drapey fabric! 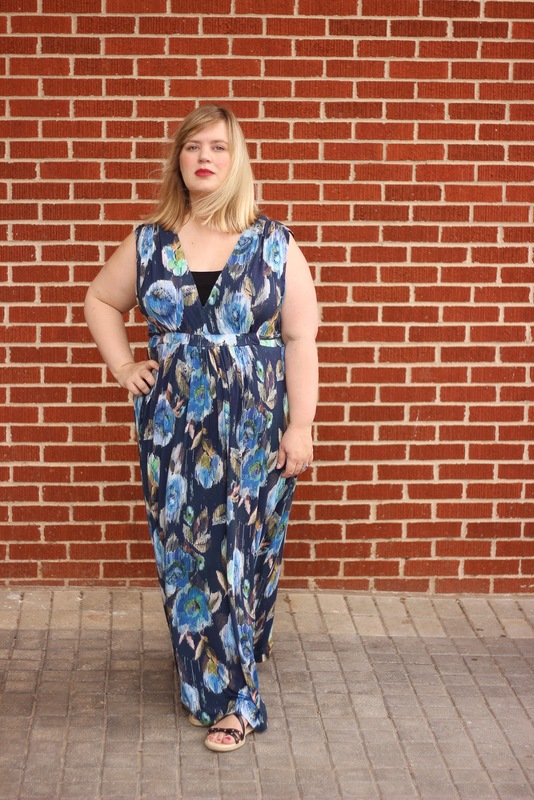 For this first version, I chose an Italian Blue and Green Floral Printed Jersey from Mood Fabrics, who have upped their knit selection lately. 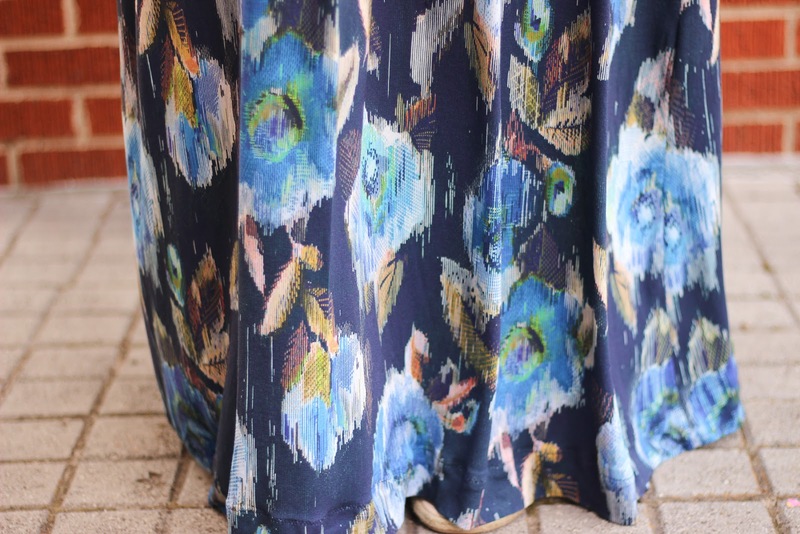 They have heaps of gorgeous rayon jerseys right now, though I fell head over heels for this digital, striated blue rose print. (Plus its red colorway sibling, which is also sitting in my stash.) The fabric is ideal for a billowy summer dress--cool to the touch, breathable, and not too heavy for such a gigantic skirt. It also ironed surprisingly well and didn't curl up at the ends, which is a nice change from cheaper rayon knit fabrics. It was even more welcome, considering how infuriating its pattern partner was. I love the final result, but the construction process made me fume. So much so that I've made a list of grievances, because yeah, I'm that annoyed. I've been bitten by Big 4 knit sizing, in the past. If I'm thankful to Indie pattern companies for one thing, it's introducing reasonable ready-to-wear ease standards into knit sewing patterns. 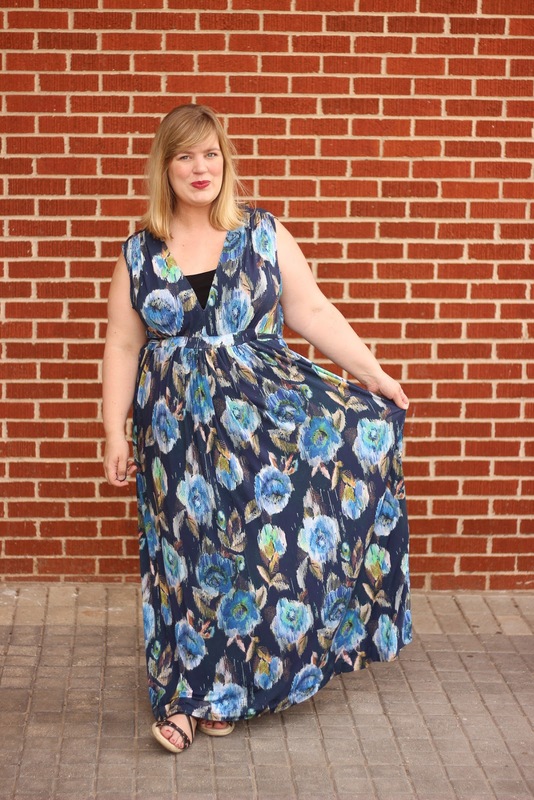 This may be a maternity dress, but there is no reason that a pattern designed for moderate stretch knits should have over five inches of ease at the bustline. Good heavens, I want bump coverage, not my own rose-printed pop up tent! Thankfully, other reviewers noted this issue. 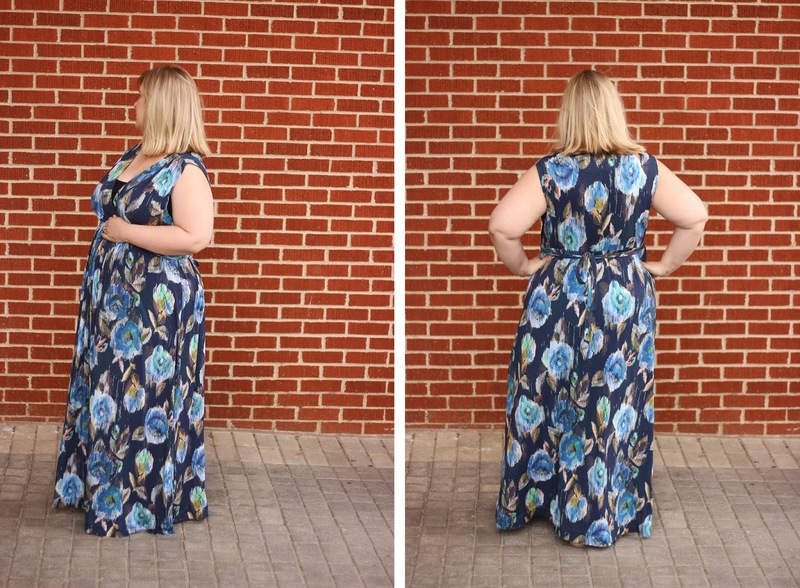 I heeded their advice and chose my size based on the finished bust measurement, which put me at a Size 16, well under my Butterick-advised 20/22 combination. This pattern would've been consigned to back-of-the-closet hell, if I'd chosen any larger. If you make this pattern, do not under any circumstances, choose your printed size. Consider this your dire warning. The requisite "Look! There's a human inside that blogger!" photo. Y'all, knit patterns should not be this fiddly. While the skirt is easy enough, the bodice is one absurd process decision after another. The side panels are not actually over-the-bust princess seams, but under-the-arm panels that do nothing but make your life harder. They do not form a smooth armscye curve, but instead a bizarre, half-sewn, half-open seam that makes getting a clean finish impossible. I ended up sewing them all the way up, instead of stopping inches short as instructed, and using loads of steam-a-seam, just to get a workable finish that didn't burn my eyes. Worse yet, the sleeves. I knew they weren't traditional sleeves, from other reviews, but I didn't fully realize how ineffective they were. You see, they're not sleeves at all. They're just floppy fabric rectangles that partially cover your upper arms. Look, I know pregnant women run hot, but that doesn't mean we need an open ventilation chamber under our arms. If I'm adding elbow-length sleeves to something, it's because I want actual sleeves, not dainty little fabric blankets to cover my biceps. The mess of a half-finished armscye and faux sleeves was too much to handle. I didn't add them after all and started contemplating a pattern-for-kindling bonfire. Hair frizz + armscye of doom! A reminder: I went two sizes down in this pattern. Take that into consideration and look at the above photos. That obscenely low armscye! That halfway-down-my-sternum neckline! Can you imagine what the correct size would've looked like? I expected to wear a camisole under this pattern, which is good, because it would be unwearable otherwise. 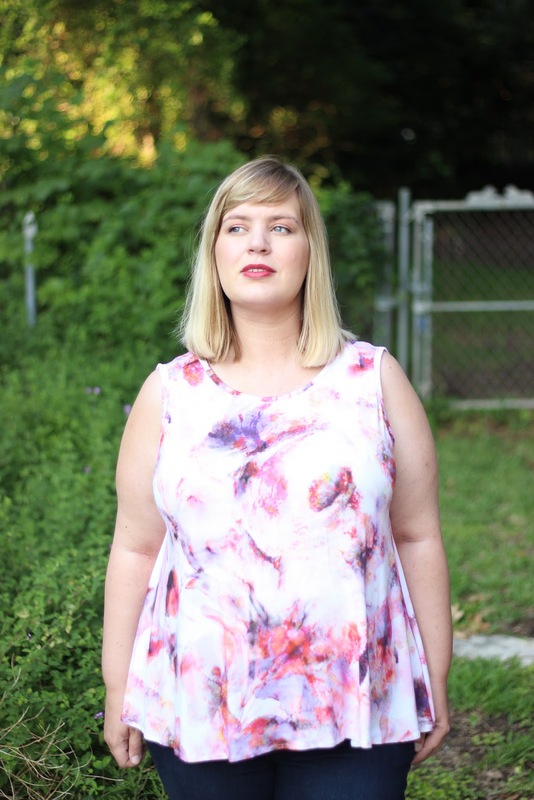 The armscye needs to be raised three inches, while the neckline needs an additional two. 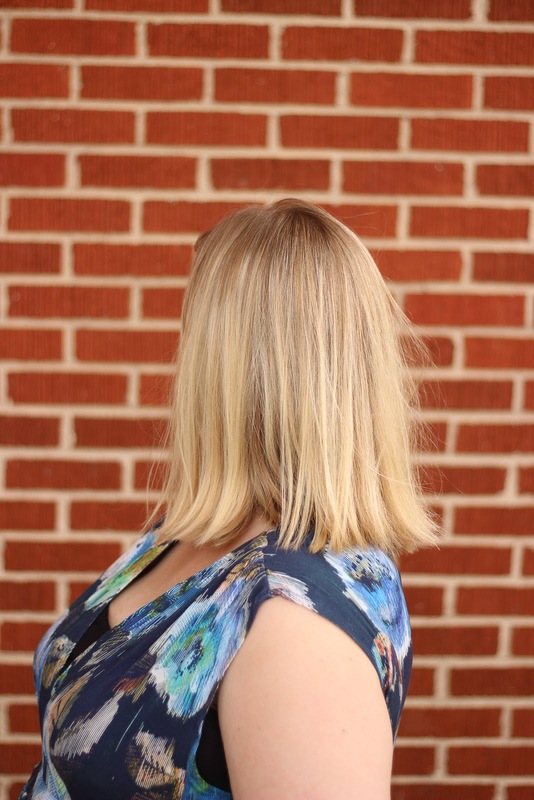 I also need to rotate the shoulder back a hair, but that's a spectacular non-issue, when compared with the other two. Admittedly, the long skirt is weighing the bodice down some, but it was designed for this skirt. This was all somehow intentional. Oof. The next time I make this, I'm redrafting the bodice entirely, eliminating the side panels and raising the arsmcye/neckline to reasonable levels. Oh look, an unironed hem! Sorry, kittens. I was apparently so blinded with anger, that I didn't press the hem upon finishing. Aside from the barely contained process rage, I like this dress. A lot. Somehow, all the messy parts came together for a flattering, glamorous garment that receives a ton of compliments out in the world. It's bit Greek goddess, a bit ritzy resort collection caftan. That's a combination that is definitely my speed, these days. Even better, there is a ton of room for growing a human in this dress. Right now, it makes me look more pregnant than I look in other clothes, just from all that extra fabric in the front. Later this summer, that gathering is going to be a lifesaver! After I finish altering the bodice, I'm going to make a few more short and long versions of this dress. Though, perhaps not the jumpsuit. I can only imagine the alterations that variation might need!